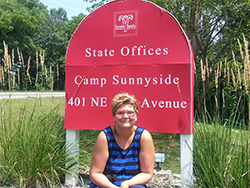 Easter Seals Iowa and Camp Sunnyside came into Bobbi Jo’s life at just the right time. Her husband had recently passed away and Bobbi Jo found she needed some extra help and support. Her daughter Allison started attending respite weekends at Camp Sunnyside shortly thereafter. Bobbi Jo and Allison both quickly started experiencing the benefits of respite services. Read Allison and Bobbi Jo's story. Dave Mathis has run multiple 5k races, has a job in the call center at American Enterprise Insurance, and an associate’s degree in community services and social work. Dave is successful from anyone’s point of view, but it is everything Dave has overcome that makes his story so special. Dave was born with a rare genetic condition. He was not able to sit up until he was five years old, or walk until age seven. 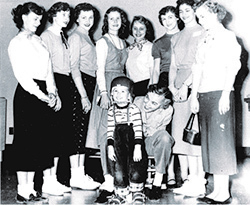 He was a camper at Easter Seals Iowa Camp Sunnyside at the time he was learning to walk, and shares what camp meant to him. Read Dave's story. When Alyssa thinks of Camp Sunnyside, Alyssa thinks of friends. It’s a theme Alyssa and her mom Bridget both talk about, and the difference these friends have made in her life. 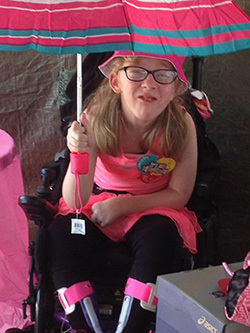 At Camp Sunnyside, Alyssa says she can just be herself. Read Alyssa's story. When Eric Taylor came to pave a road at Camp Sunnyside as a pro-bono job for his father’s construction company, he didn’t know the clients and families served by the organization were about to take hold of his heart. Read Eric's story. Al Buck describes himself as the “grade-school poster child in Iowa for Easter Seals.” And he has the posters to prove it! Originally from Marshalltown, Iowa, Al was diagnosed with cerebral palsy at birth, living in an iron lung for the first few months of his life. Al received occupational and physical therapy at Easter Seals Iowa. He still remembers the building to a tee, and the people who taught him how to walk and tie his shoes. Read Al's Story. 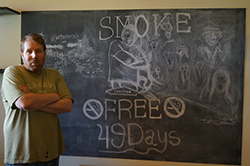 Smoke-Free for 49 Days and Counting! Chris really wanted to quit smoking and completed the 8-Week Freedom from Smoking Class offered through Easter Seals Iowa. He was able to quit! As an added incentive, when Chris stayed smoke-free for 30 days after the class, he received a cleaning service in his apartment, where he had smoked for 16 years! Read Chris's story. 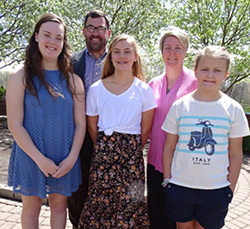 Lauren’s parents Mike and Pam Morrison were hesitant to send their daughter to Camp Sunnyside because of her high medical needs. Realizing the benefits of Camp for their family and for Lauren, her parents decided to give it a try and sent Lauren to Camp. They are glad they did! Read Lauren's story. Imagine picking your child up from Camp Sunnyside, and hearing him say his name for the first time! That’s exactly the surprise Dom’s mom Crystal received last year. Read Dom's story. 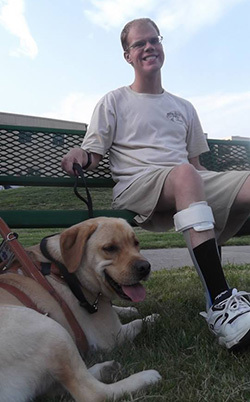 When Kyle Spalding decided to pursue his master’s degree in Rehabilitation Counseling after he experienced a spinal cord injury, Easter Seals Iowa was there to support him along the way. 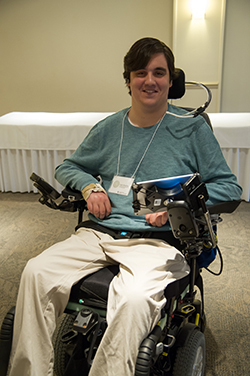 In addition to providing assistive technology needed for the classroom, Kyle says the emotional support, resources, networks and connections to other individuals with spinal cord injuries were immeasurably beneficial for his recovery. Kyle is on track to graduate in May. Read Kyle's story. A little over a year ago Josh was struggling with many barriers which prevented him from having a home and a job. Josh began receiving support in a community living environment, which enabled him to access day programming and substance abuse programming. Read Josh's story. John is hooked on giving back. As a child, he grew up in the foster care system and wants to use his experiences to make a different for others. 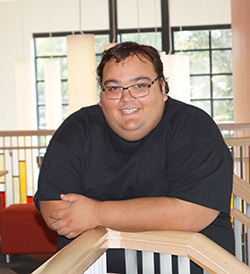 John is pursuing his bachelor’s degree in Social Work from Grand View University. He volunteers at the Department of Human Services, where he helps children in the foster care system learn life skills. John is incredibly successful in reaching his goal of independence. Read John's story. When health problems started interfering with Julie’s life, she decided it was time to make a change. She lost 172 pounds, or 52% of her original body weight, and went from walking for five minutes at a time to recently finishing her third 5K. 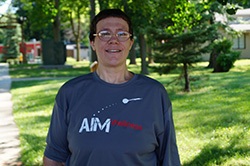 In addition, Julie reversed her diabetes diagnosis, high cholesterol, high blood pressure and sleep apnea disorder. Read Julie's story. Morgan has been attending Camp Sunnyside for the past three years. Her mom Toni said because of Easter Seals Iowa, Morgan has found a sense of belonging and understanding. 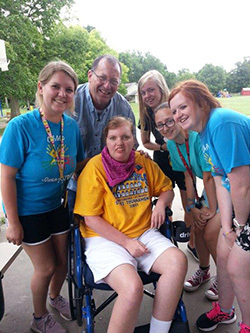 Morgan’s first experience at Camp Sunnyside was spending an overnight respite weekend. Read Morgan's story. 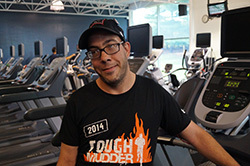 At 28 years old, Adam didn’t expect to be paralyzed. After a snowmobile accident, Adam knew he wanted to continue farming, but didn’t know how he would be able to continue his way of life. Read Adam's story or check out this video about Adam. 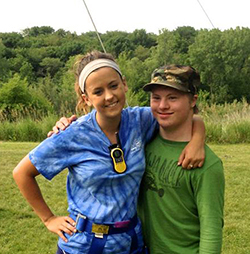 Jacob Zobeck of Ridgeway, Iowa, in Winneskiek County travels more than three hours each year to get to Easter Seals Iowa Camp Sunnyside in Des Moines. Jacob’s parents Carol and Randy say, “Jacob talks about Camp from the minute we pick him up until we drop him off the next year.” Read Jacob's story. As an adult, I now understand the breadth of services provided by Easter Seals Iowa and can truly appreciate the needs fulfilled for my parents as they coped with their child’s newly diagnosed disability. As that child, I truly appreciate the treatment services received and am even more grateful for the courage Easter Seals Iowa instilled in me to live life on my terms and not be limited by my situation. Ready Cathy's story. 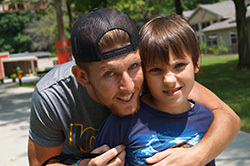 Fishing, boating and climbing the rock wall are a few of Blake’s favorite things about Camp Sunnyside. Blake’s mom Margie says Camp Sunnyside is a place where Blake is understood, cared for and loved. Watch Blake's story. “Easter Seals Iowa offered me hope and encouragement, that I too could be a productive part of society after acquiring a disability. With the support of Easter Seals Iowa, I am doing just that - working, volunteering, and enjoying life to the fullest,” Angie says. Read Angie's story. During her years of service as an Air Force medic and paralegal, Brenda acquired disabilities that made it difficult to easily move about her home. Easter Seals Iowa helped make accommodations to Brenda’s home, making it easier for her to live in. 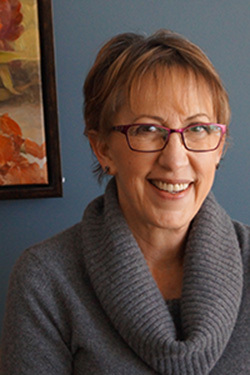 Read Brenda's story. Kaitlyn is right at home in the Mercy Hospital Starbucks—making mocha, chatting with customers while cleaning the condiment bar, and whisking together homemade whipped cream. Through the Project SEARCH internship program, Kaitlyn built experience in a workplace setting. Read Kaitlyn's story. 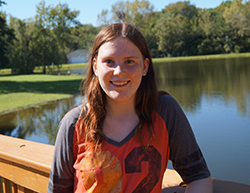 Charity has grown her skills and confidence in the past few years through her own personal goals and with the support of Case Management services at Easter Seals Iowa. Charity is unique from others in her commitment to always be the best that she can possibly be. 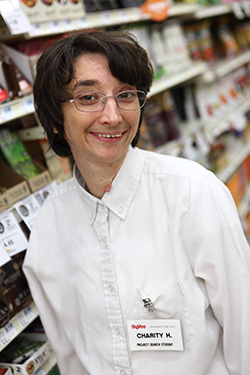 Her supervisors at Hy-Vee say she embodies their slogan of “a helpful smile in every aisle.” Read Charity's story. 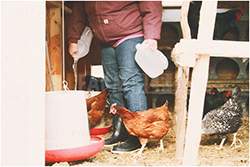 “I wanted to continue farming as my livelihood and contribute in a meaningful way in my community. 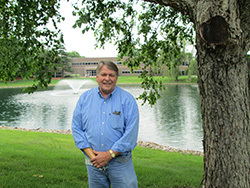 I wouldn’t have my operation and be where I am today if it weren’t for the staff at Easter Seals Iowa," Russell says. Read Russell's story. 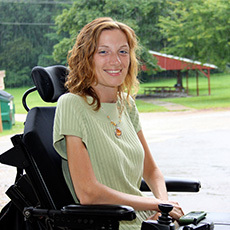 After a car accident, Laura says life was at a standstill before she was connected with Easter Seals Iowa. She learned to walk, talk and eat again and is now independent with her own apartment and employment. Watch Laura's story. 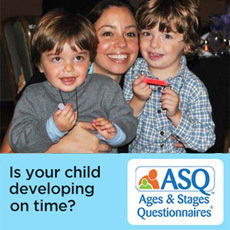 Most people take for granted being able to have a conversation with their child, for us it was a gift. Both summers our daughter Rio attended the Easter Seals Iowa Child Development Center, we noticed marked improvements in her behavior. She made her first friend there and was so excited to come home and tell us about her. Read Rio's story. McKenzie Ackerman is from rural Hubbard, Iowa and travels to Des Moines to attend Camp Sunnyside each year. Her mom Trish says that at Camp for the first time, McKenzie rode a horse, experienced the zip line, shot an arrow and went boating on Lake Cheerio. Read McKenzie's story. Daniel Feltz of Union, Iowa, has been attending Camp Sunnyside since 2008. His mom Kay says, “Daniel loves the whole camping experience—being independent from us and going somewhere new and different. We have a respite, knowing he is in really good hands.” Read Daniel's story. Ryan Odens and his brother Nick from Little Rock, Iowa, farm 1,100 acres of corn and soybeans and 50 acres of hay. His family says all Ryan has ever wanted to do is farm and carry on the family legacy. During harvest season the year of Ryan’s accident, the entire town turned out with wagons, tractors and combines to support Ryan and his family with their harvest. Read Ryan's story. 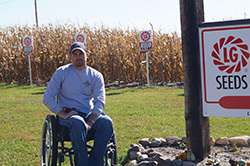 After losing his right arm in farming accident, Michael continued his dairy farm business in Ackworth, Iowa, for 14 years. During that time Easter Seals Iowa provided support and made adaptations to gear shifts on Michael’s equipment. Read Michael's story. 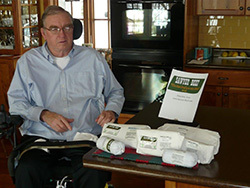 Sawyer Beef is recognized as locally grown beef in the Quad Cities area. The meat is sold at farmers' markets and in local grocery stores. The Sawyer farm is located in Princeton, Iowa, and the family has been farming in Scott County for five generations. Read Norman's story.